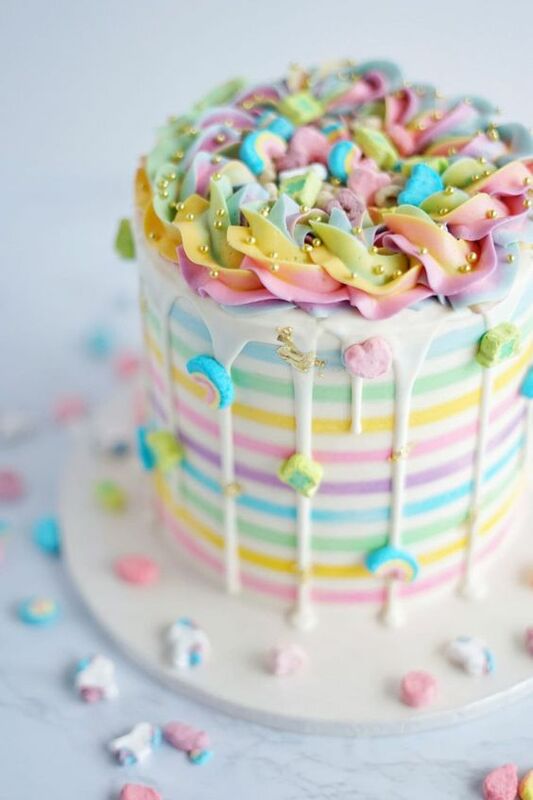 This Rainbow Cake, complete with a marshmallow frosting and Lucky Charms cereal, is the perfect show-stopper for your upcoming St. Patrick’s Day celebration! Inspired by gold coins, rainbows, and, of course, the luck of the Irish, this rainbow cake is the best way to get you in the mood for St. Patty’s Day! Add Lucky Charms and milk to a large bowl and let sit for about 45 minutes – 1 hour. Reserve the milk and set aside. Preheat oven to 325° F. Spray three 6-inch cake pans with cooking spray, and line the bottoms with parchment paper. In the bowl of a stand mixer fitted with a whisk attachment, add the dry cake mix, ground Lucky Charms, sugar, and salt. Mix until combined. Switch to the paddle attachment and add sour cream, vegetable oil, vanilla, eggs, and cereal milk. Mix on low-medium speed just until combined but do not overmix. You can add any food dye at this time if you wish (I used turquoise). Remove from oven and let cool. Transfer to countertop covered with parchment paper by running a knife around the cake edges, then turning the cake pan upside down to release the cake. Once completely cool, you can wrap these in saran wrap and place in a gallon size freezer bag; you can freeze the cake layers for about 2 months. When ready to fill the cake, use frozen cake layers to prevent the cake from crumbling while decorating. Add butter and marshmallow crème to the bowl of a stand mixer fitted with a paddle attachment. Beat on medium speed until light and fluffy. With the mixer on the lowest setting, slowly add powdered sugar, one cup at a time. This is a very sweet frosting so you will want to taste test before adding all of the sugar. Add vanilla, salt & heavy whipping cream and mix on medium speed until combined and smooth. If the cake layers do not bake evenly, you can use a bread knife to trim the top off and make it flat which is easier for decorating. If you froze the cake layers, you will need to let the cake layers thaw just a bit before trimming. Start with the frozen/semi-thawed cake layers, and place one layer on a cake board. You can use a spoonful of buttercream as “glue” between the cake layer and cake board if you like. Pipe a circle of buttercream around the perimeter of the cake layer to create a barrier before adding the marshmallow frosting (this will prevent the marshmallow from spilling over the edges of the cake). Spread an even layer of buttercream over the top of the 1st cake layer. Repeat with remaining cake layers and frost the outside with the swiss meringue buttercream. If you choose to put cereal between the cake layers, it’s best to keep the cake refrigerated & eat the cake within a day or two so the cereal doesn’t get soggy.